Since 2017, 12 families a day on average have been evicted from their homes in Travis County. Many people had lost a job, experienced a medical emergency or had a roommate leave without notice. Like many 4-year-olds, Leah Barnett likes surprises. Before 7 a.m. on her first day of pre-K, Leah plopped her blue backpack on her grandmother’s couch. Each school supply delighted Leah. And each one was indeed a surprise – gifted to her by her new public school in Killeen. The fact that she was starting school in this small town more than an hour north of Austin was also a surprise to Leah and her family. In July, Leah’s mom, Brittany Phillips, was evicted along with her husband and three kids from their North Austin home. They joined thousands of other households evicted each year in Travis County. According to an analysis of five years of eviction data by KUT, the threat of eviction in Travis County is nearly three times more common than reported by Eviction Lab, a new project to publish nationwide eviction data. Since 2014, eviction filings here have steadily risen. An increase in rental units alone can’t explain this. Stories of eviction are stories of what it means to be poor in Austin. These are not stories of people unable to afford an apartment on Day One; landlords screen for this. These are families like the Phillips who are unable to save for a crisis – so when something unexpected happens, it wrecks them. Leah’s parents rented one bedroom in a two-bedroom apartment, cramming a blow-up mattress against the wall for the kids to sleep on. Her in-laws rented the second bedroom. But when they moved out with little notice, Philips and her husband, Chris Barnett, could not afford the full $950 monthly rent. Barnett liked his job as a technician at a car dealer, but a good portion of his paycheck went to child support for three other kids. He typically brought home $800 a month. The family received roughly $400 a month in food stamps. After paying for gas, utilities, a car payment and anything Leah and her brothers needed, money was tight. It’d been like that for a while. Three years ago, Phillips was diagnosed with fibromyalgia, a condition that causes chronic pain and fatigue. She quit her job as a fish cutter and cashier at a seafood market. "I couldn’t get out of bed and sometimes my muscles would go real limp,” Phillips said. “My husband would have to pick me up and take me to the bathroom." A month before the eviction, Phillips started working part-time as a home health aide, making $8.50 an hour. The extra income helped, but they still couldn’t afford the unplanned jump in rent. When they knew they wouldn’t be able to afford to pay for July, Phillips scrambled. "I have three kids and we didn’t want them sleeping in the car,” she said. Phillips called churches for help and managed to piece together $500. But it wasn’t enough to cover the $1,200 the family owed the landlord. When a judge granted her landlord’s eviction, Phillips and her family packed what they could fit in a truck — the kids’ blow-up mattress, a toy kitchen set. What they couldn’t stuff into the bed of the truck they trashed. They drove everything to Barnett’s parents’ new house in Killeen. They can't afford the gas to drive the two-hour round trip each day to their jobs in Austin, so they've been unable to work. "I want to go back to Austin once we can afford it,” Phillips said, sitting in her in-laws’ kitchen. As time passed, that started to feel more and more like a dream. But they caught a break in August. 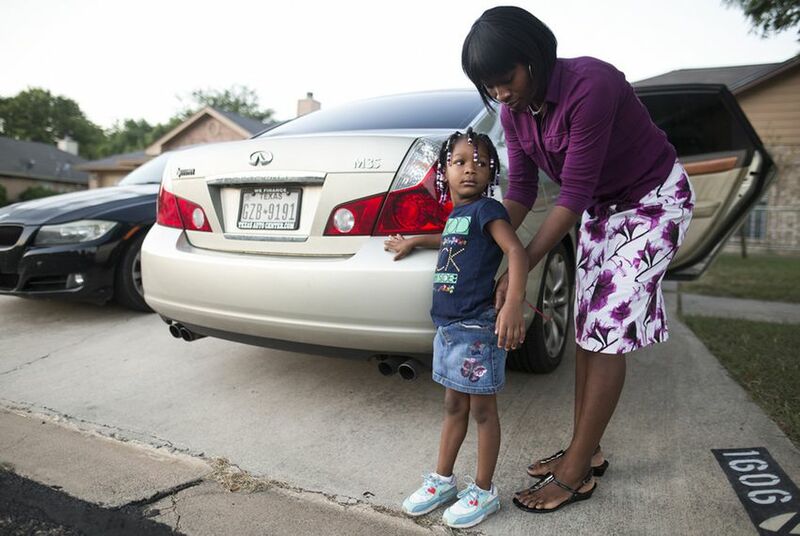 Phillips learned that her family was now eligible for public housing in Austin – after nearly six years on a waitlist. In other words, Leah wasn’t alive when Phillips got on this waitlist. The program requires tenants to pay only 30 percent of their current income toward rent. The family is still waiting to hear when a unit will become available for move-in; it could take another month or two. Every day, dozens of people who can’t pay their rent walk into a Travis County courtroom. They sit in front of judges who listen to their stories even when the details of those stories – a pediatric nurse whose roommate unexpectedly left, an elderly couple robbed by a friend’s son, a mom short on rent by $283 – can’t figure into their judgments. They sit beside bailiffs who keep order in the courtroom by handing out tissues. But a lease is a contract and the law is clear. “I’m awarding possession to the plaintiff,” is a phrase you’ll likely hear in eviction court. That means the tenant has five days to move out. Justice of the Peace Nick Chu presides over much of Central Austin, including downtown. On busier weeks, he sees about 20 eviction cases; judges in Southeast and Northwest Austin see twice as many. In the vast majority of eviction cases that go through the courts, a tenant has not paid rent. Evictions for lease violations or simply because a landlord wants someone out are uncommon, judges say. Last year, landlords filed 9,313 evictions in Travis County courts. Judges ruled nearly half of these cases evictions, while the rest were dismissed or appealed to a higher court. Once a tenant is late on rent, the landlord tapes a note to the apartment door – called a "notice to vacate" – letting them know they will file for eviction in court if the tenant has not paid or left in three days. “I will tell you that most landlords would be thrilled if in the face of a notice to vacate the tenant either paid or voluntarily vacated,” said Corey Rogers, a real estate lawyer with Warren Law Firm in West Lake Hills. Rogers, who has represented landlords in eviction cases, said his clients would rather not go through the hassle and court costs associated with an eviction. For tenants, the feeling is mutual, but the effects of an eviction endure. Tenants' advocates say many renters choose to leave once they receive a "notice to vacate" because potential landlords can see an eviction filing even if a case is eventually dismissed. Once a landlord files an eviction, the court sets a date. In eviction court, lawyers are rare – for tenants and landlords. Landlords typically have representation, but it's often a property manager or a representative from an eviction management company that, for a fee, will handle the entire process. If a case is ruled an eviction by a judge the tenant has five days to move out. If they do not leave in that time, a landlord can ask a constable to forcibly remove the tenant and hire movers to carry the tenant’s belongings to the street. The whole process – from failing to pay rent to being kicked out by a constable – can take as little as two weeks. While eviction filings have risen over the past five years, the percentage of these cases that result in a court-ordered eviction has fallen. In 2014, judges ruled in favor of the landlord in 52 percent of eviction cases; in the first three months of 2018, that has dropped to 46 percent. Judges and attorneys don’t have a clear answer as to why. But they have guesses: Texas RioGrande Legal Aid attorney Fred Fuchs said the rise in eviction management companies, which simplify the process, make cases easier to file but also easier to dismiss if a tenant pays up before court. 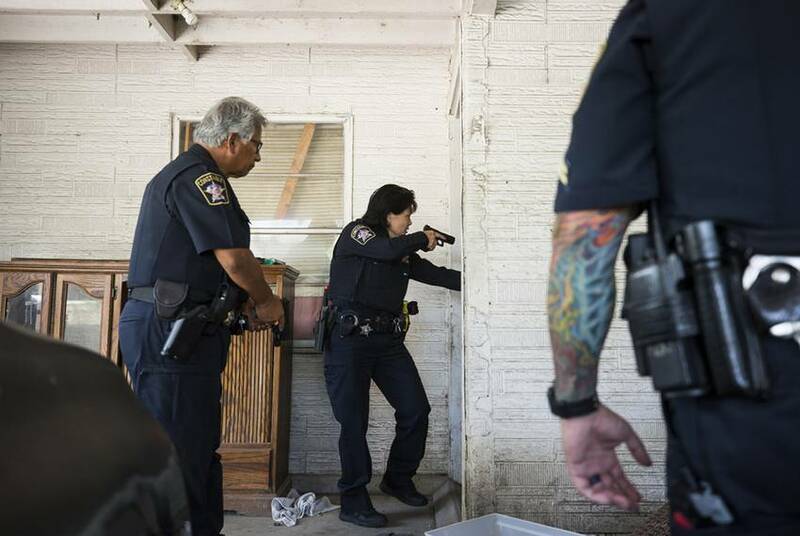 Travis County Deputy Theresa Stewart works both ends of the eviction process, from serving papers to kicking out tenants. At a second address, three tenants were still in the house when Stewart arrived. Deputies banged on the door: “Police! Constable’s Office!” They entered with their guns drawn. Two men and a woman scrambled out, disheveled. The woman wore pajamas. Constables stood by as several men carried the tenants’ things out to the curb. Two of the tenants loaded what they could into an old Honda Civic. They said they had nowhere to go for the night; they’d probably sleep in their car. Stewart said she encourages tenants to try to broker an agreement with their landlords before an eviction ends up in court. But pride, she said, gets in the way. “I feel like I’m stuck evicted"
Karen Woodward woke up in a rundown gray Honda Civic she’d stationed in a Walmart parking lot. It was a hot July morning. She cleaned her face with a rag in the car’s sun visor and wet her toothbrush with water from a water bottle. Depending on how populated the parking lot was, she sometimes crouched beside the car and shimmied into her nursing scrubs. On the days her car would run, she drove the couple miles to her job as a medical assistant at a pediatrician’s office in West Lake Hills. On the days it wouldn’t, she took the bus as far as it would go or hitchhiked the way there. Work would distract her from everything else in her life. “There are kids that come in that are very scared to get shots,” said Woodward, who has four children of her own. Woodward was evicted in June from the $1,400-a-month home she shared with her ex-husband in South Austin. The two had a falling out, and he left with little notice, taking the TV and his share of the rent. Around the same time, the federal government began garnishing part of her pay to rectify a student loan she’d defaulted on. After the garnishment and missing hours at work because of car trouble, the paychecks Woodward got twice a month dropped from roughly $1,250 to $600. She said she had nowhere to go and little understanding of what social services were available to her. In a city like Austin, that upset her. “How do you get [help]? Where is it? It’s like it’s a secret and you have to go on this treasure hunt to find it and this secret tunnel or a maze that you have to know the code and to get the code you have to go on a separate hunt for the code,” she said in between bites of fried chicken and mashed potatoes she'd bought for dinner at Walmart. Woodward steadied the plastic to-go container on the trunk of her car. "Where are the resources? I know that there are resources in this city. This is a very wealthy city," she said. There are resources — but they come with restrictions. Woodward applied to the Travis County Emergency Rental Assistance program, which offers one-time cash help for renters and homeowners. But Woodward, who earns $17 an hour, made too much to qualify. Even if she had qualified, the program’s help may have only gone so far. Until recently, the county wrote rent checks based on 2007 median rents. Someone living in a one-bedroom could receive up to $512; the median monthly rent on a one-bedroom in Austin these days is at least twice as much. In August, Woodward got off the waitlist at a dorm managed by the Salvation Army. But by then her car had died and relying on public transportation to get from work to the bed downtown was too stressful. Woodward ended up sleeping on the streets for two weeks; one night she napped in a laundromat. And without a working car, she often got to work late. Her supervisor pulled her aside several times to reprimand her. The stress caused by an eviction is hard to put aside once someone shows up for work. In his book Evicted, Princeton sociologist Matthew Desmond writes, “Eviction isn’t just a condition of poverty; it’s a cause of poverty.” He tells the story of a woman named Tina who loses her part-time job at a construction company; she attributed her layoff to the stress of the eviction and not having reliable transportation. “[An eviction] causes you to make mistakes at work, lose your footing there,” Desmond told NPR. Woodward is currently staying with a man she met at a convenience store. He had converted a retired school bus into a live-in trailer and parked it on a 2-acre lot in North Austin. Sometimes he drives her to work or lets her borrow his truck. Woodward has shelter and said she feels safe. But she hasn’t yet been able to scrape together the several thousand dollars – she estimates $3,000 – needed for a deposit and first month's rent to move into a new apartment. Plus, she now has an eviction on her record. “I feel like I’m stuck evicted,” she said. Tenants facing eviction live in concentrated pockets in Travis County. Since 2014, nearly half of the eviction cases filed in the county have been against families living in six ZIP codes: 78723,78724, 78728, 78741, 78753 and 78758. These neighborhoods map most of North Austin, from Windsor Hills to Rundberg to Wells Branch, and a small part of Southeast Austin. But courts do not record demographic data, so while we know where evictions happen it’s hard to know who is affected. Geographic data suggests evictions affect mostly low-income people of color. The average annual income in the ZIP codes with the most eviction filings is roughly $44,000 – less than half the median family income for all of Travis County. Many of the people living in these neighborhoods are Hispanic. And then there’s Pflugerville. The city – which encompasses half of the ZIP code 78660 – has one of the highest eviction rates in Travis County. In 2017, renters in Pflugerville and neighboring areas were evicted at a rate twice as high as tenants across the county. Yet, the Austin suburb is wealthier and has far fewer renters than other neighborhoods with high rates of eviction. These numbers confounded elected officials. “While your research is indicating that eviction is an issue in the 78660, in my 11 years on City Council, I have not had any resident approach me about this concern,” Pflugerville Mayor Victor Gonzales wrote in an email. Pflugerville Council Member Rudy Metayer was also surprised. "When we’re looking at even spending applicable funds that would benefit people of low-income households, we have a hard time searching for them and frankly prompting them to apply for things,” he said. Growing costs of living in Austin are causing more low-income people to leave the city for more affordable pockets outside. “[With] what’s going on regarding the lack of affordability in Austin, [the low-income population] is only going to grow in Pflugerville, in Round Rock, in Hutto, in Taylor, in Manor,” Metayer said. “I had to think of the kids"
Anjeanette Walker-Powell wakes up thinking of the dinners she’ll cook. On a recent Thursday night, Walker-Powell stood in front of a four-burner stove cooking fried tilapia, mashed potatoes from a box and steamed vegetables. Four hungry kids moved in and out of the hallway leading to the kitchen – watching TV, ironing clothes for the next day and using the computer. Walker-Powell does not have a lot of money. Five years ago, her mom died of heart problems. Walker-Powell, who was in her early 20s at the time, got custody of her four siblings; the oldest is 15, the youngest is 11. She has proudly labeled herself a “sister-mom." The family’s money problems started when the kids got out of school for the summer. Suddenly, Walker-Powell was responsible for feeding them three full meals a day; school had been providing them breakfast and lunch. Her monthly food bill jumped to $600. The $882 rent on the three-bedroom in a public housing complex in North Austin became harder to pay. In May, rent was late. Walker-Powell couldn’t find the money for June. In July, the eviction notice came. Walker-Powell sat in eviction court in July. She was nervous, she said, wracking her brain for anything she would say to buy her more time. It seemed like everyone called before her was getting evicted. 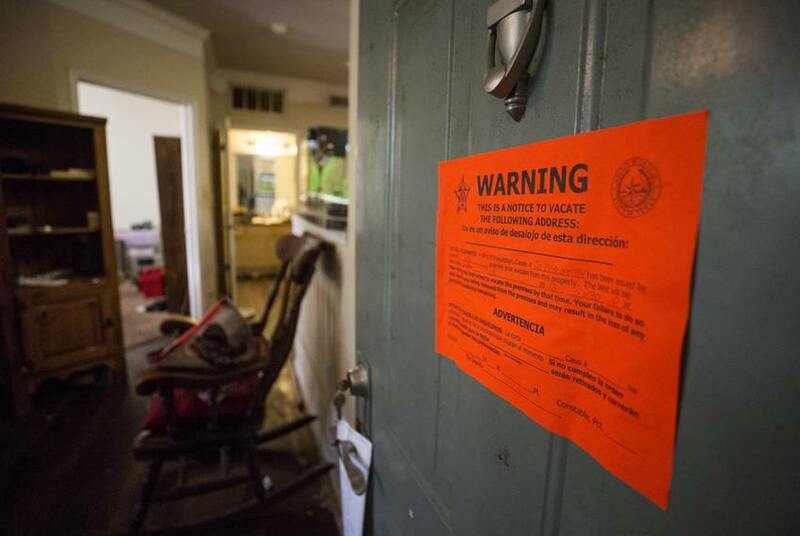 Last year, Austin City Council members began talking about the problem of evictions. In the budget passed recently, council members funded their first eviction policy: allocating $75,000 for nonprofits to help tenants through the eviction process. Tenants advocates have suggested other ideas: capping the amount of late fees landlords can charge, requiring landlords to give tenants more notice before an eviction is filed and educating nonprofits on financial assistance programs for people facing eviction. Policies in other cities are more extensive or have more funding. In 2017, New York City passed a law mandating that low-income tenants have legal representation in eviction court. Philadelphia recently rolled out a $500,000 program to provide legal and financial help for people facing eviction. Judges will tell you that most eviction cases they see are because tenants can no longer afford their rent. Counseling is helpful – but so is money. According to court data, tenants evicted in 2017 owed a median rent of $1,292. In the first three months of 2018, that jumped to $1,420. "I think the most obvious solution is to increase the earning potential of low-income folks in Austin and also make sure that housing is affordable,” said Gonzales, formerly with the Austin Tenants Council. When Walker-Powell finally took a seat in front of a judge, he asked if she could come up with the $1,894 she owed if he gave her five days. A representative for the Housing Authority of the City of Austin agreed. Walker-Powell decided she would try. She spent the next couple of days getting creative. She took out a loan for $300. A friend lent her another $300. She emptied the $587 she had in savings. Despite the shame she felt going to them, Walker-Powell asked her grandparents for the rest. They gave her the last $707. Walker-Powell handed the money order to the court clerk three hours before the judge’s deadline. Walker-Powell said having access to people with cash is what kept her from being evicted.